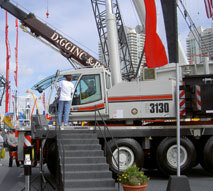 The experts at Isom Crane & Rigging Safety Specialists have inspected hundreds of job sites. Through our extensive experience, we are able to bring a truly professional inspection team to your job. As you know, in the construction industry today, risk management is a necessary concern of any development project. This is even more important in any project employing a crane. How can you be sure you equipment is safe and abile to handle the workload? The answer is simple. Contact Isom Crane and put their experience to work for you. There is no phone call that will give you greater piece of mind.